Please remember to consult with your diabetes care team before making any changes to your diabetes care. Information provided is for your consideration only and is not meant to be taken as medical advice in any way. 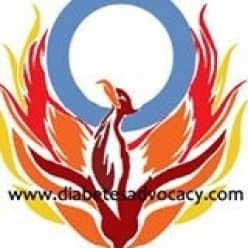 A diagnosis of diabetes can be overwhelming. Suddenly you are expected to learn an entirely new language made up of terms like glucose, blood glucose monitoring, self-monitoring, insulin, and glucagon. To help make things a little easier, here is a basic introduction to some of the terms you will need to know as you care for your diabetes. 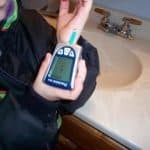 Blood glucose monitoring can be done using the tips of the fingers, as well as Alternate Site Testing (AST) on such places as the sides of the hands, the forearm and the leg. When in doubt or if a low is suspected always use the fingertip for most reliable results. While most people do not find a time lag when using AST, current research recommends that lows be monitored through finger checks. Why is it important to check blood glucose levels? 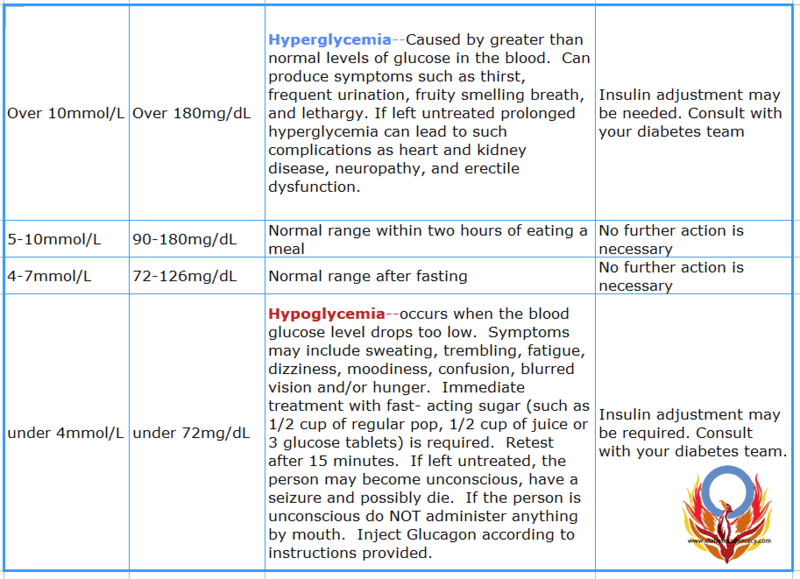 In order to properly manage your diabetes care, it is important to know what your blood glucose levels are. If they are too high or too low, it can lead to disastrous long-term and short-term complications. When should you check blood glucose levels? glucose levels at least four times per day. night-time basal insulins are working properly. Please consult with your diabetes team to see how often you should check your blood glucose levels. But what does “blood glucose monitoring” mean? Glucose is a type of sugar. The body forms glucose when it breaks down the food we eat into a useable form of energy. Glucose is the body’s main source of energy. Measuring the amount of glucose found in your blood helps to show how the body is breaking down food into energy, as well as how the liver is working. 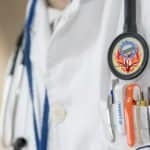 is often used in a clinical setting to diagnose diabetes. It may be a 2-hour Postprandial check which occurs when a blood check is done within 2 hours after a meal. Finally, random blood glucose check can be done at various times throughout the day to manage unexpected highs or lows. What do the numbers on the meters mean? Under certain conditions, blood glucose check results obtained using samples taken from your arm may differ significantly from fingertip samples. The conditions in which these differences are most likely to occur are when your blood glucose is changing rapidly such as following a meal, an insulin dose or associated with physical exercise. When blood glucose is changing rapidly, fingertip samples show these changes more quickly than arm samples. 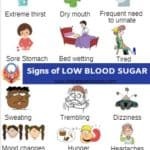 When your blood glucose is falling, testing with a fingertip sample may identify a hypoglycemic (low blood sugar) level sooner than a test with an arm sample. Use arm samples only for testing prior to, or more than 2 hours after, meals, insulin dosing or physical exercise. Checks performed within two hours after a meal, an insulin dose or physical exercise, or whenever you feel that your glucose levels may be changing rapidly, should be done from the fingertip. You should also use fingerstick check whenever you have a concern about hypoglycemia (insulin reactions) such as when driving a car, particularly if you suffer from hypoglycemic unawareness (lack of symptoms to indicate an insulin reaction), as arm testing may fail to detect hypoglycemia. Checking on the side of the hand using the Freestyle Mini™ glucometer. Checking on the side of the arm. For many people, postprandial ideals are hardest to achieve after breakfast. One way to avoid this “spike” is to look at adjusting the time at which one boluses. If the bg levels are low before breakfast and you are having a low Glycemic Index meal, you may wish to bolus within 15 minutes of the meal. If you have a high bg level and a high glycemic index meal, one would try to bolus 15-20 minutes before the meal. For normal to moderate glycemic index meals, one would one to bolus about 5 minutes before the meal. Another option is of course to try John Walsh’s “super bolus“. This incorporates some of the basal rate into the initial bolus. 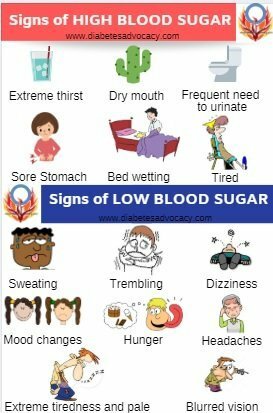 Download the symptoms of high and low blood sugar levels here. Ketones occur when the body breaks down fat for energy instead of getting energy from the carbohydrates found in your diet. If your diet does not contain enough carbohydrates to supply the body with sugar(glucose) for energy or if your body cannot use blood sugar (glucose) properly, stored fat is broken down and ketones are made. This can be very dangerous for people who have diabetes. The most accurate method of testing to see if the body is “spilling ketones” is to use a home blood ketone meter such as the Precision Xtra ™. 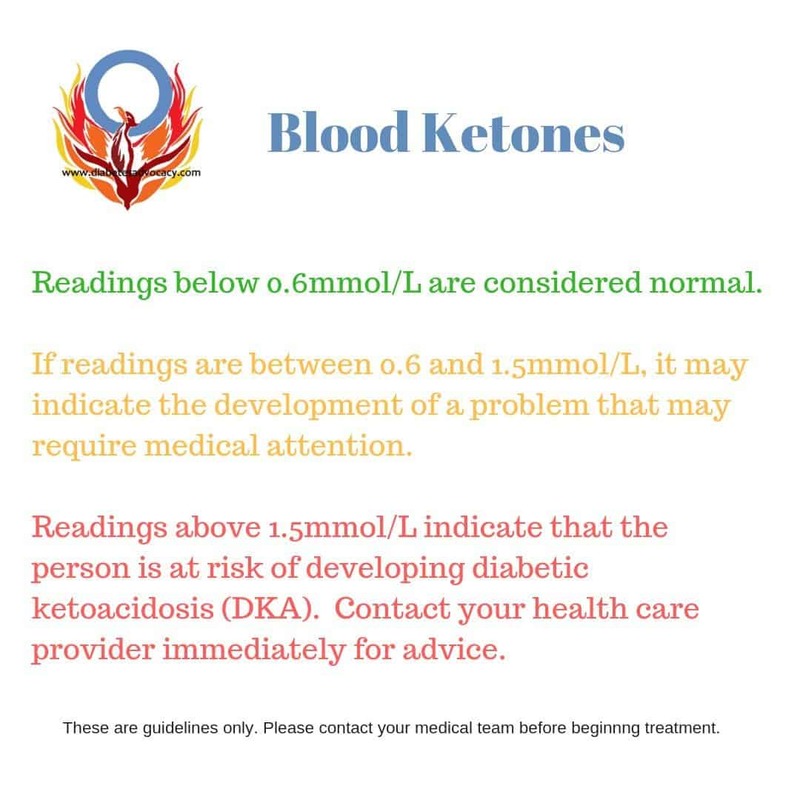 A urine test will also detect ketones but it is less accurate than a blood test. What is the difference between fingerstick glucose monitoring and using a Continuous Glucose Monitor? Fingerstick Glucometers are portable devices that read glucose levels from a blood sample that is placed on a tiny test strip. Test strips are discarded after a single use. Meters store a limited number of glucose results in their memory. The results can be downloaded into a computer. 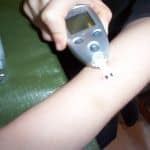 A Continuous Glucose Monitor (CGM) requires glucose sensor (a tiny electrode) that is inserted by the person with diabetes under their skin (subcutaneous tissue). It continuously records glucose levels around the clock. The sensor is worn for up to seven days before it is discarded and replaced by the patient. Glucose readings are transmitted to a monitor, smart device or insulin pump where the values are displayed. Trend reports and charts can be viewed after data is downloaded to a computer. 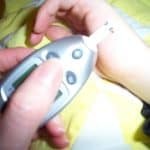 A Flash Monitoring System is similar to a continuous glucose monitor but readings are only received when the “wand” or reader, is passed over the sensor. For more information on both devices, please visit go to our CGM page. 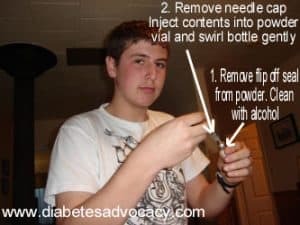 For people who no longer produce insulin, like those living with Type One Diabetes, there are two methods of insulin delivery available to them–insulin injections or the use of an insulin pump. 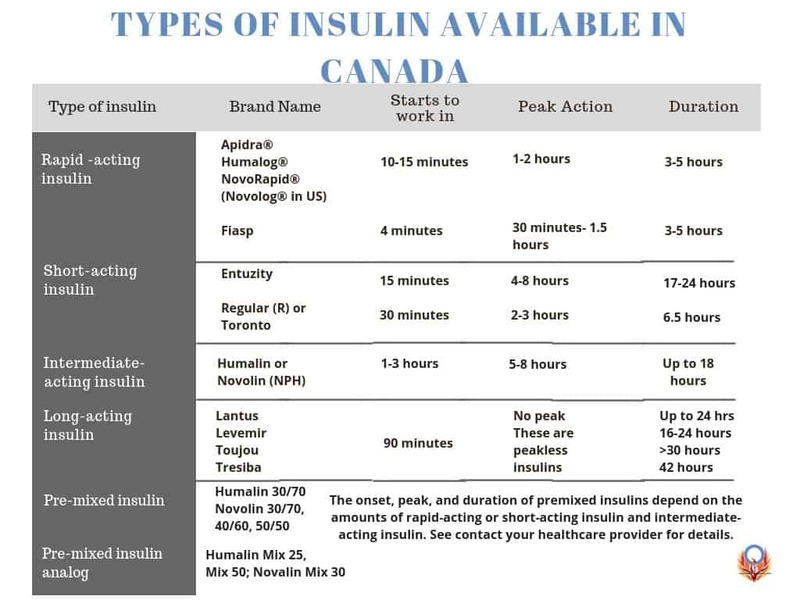 Insulin injections can be taken once a day or for more intensive management, multiple times throughout the day to manually mimic the actions of the pancreas. Usually, a combination of long and short/rapid-acting insulins are used to achieve this. Insulin pumps are small, computerized devices that deliver specific amounts of insulin to the wearer through tubing. This is not an artificial pancreas but an insulin delivery method. For a complete listing and detailed information, please see our Insulin Pump page. A1C (or HbA1c) is a measure of how much glucose is stuck to your haemoglobin. Haemoglobin is a protein inside your red blood cells. It is the part of the red blood cell that carries oxygen from your lungs to the rest of your body. Haemoglobin also carries glucose, because glucose can stick to all kinds of proteins in your body. Once glucose sticks to haemoglobin, it is stuck there for the life of the red blood cell, about three or four months. The more glucose there is in your blood, the more will end up stuck to the haemoglobin. Your A1C reading tells you what your average blood glucose level has been over the last two or three months. If you have lots of glucose in your blood and your average blood glucose has been high for the past few months, then your A1C will be high. Diabetes Canada’s Clinical Practice Guidelines recommend that anyone living with diabetes have their A1c checked every 6 months. Please remember that these are guidelines. Consult with your diabetes care team to determine where your ideal A1c should be. Everyone who uses insulin should have a glucagon emergency kit on hand at all times to counteract severe hypoglycemia that causes loss of consciousness, or if sugar cannot be given. The glucagon kit should be stored where all the family members know where to find it. Storage temperatures should be under 90 degrees F (28 degrees C). Glucagon, like insulin, must be injected. Within the glucagon kit is a syringe pre-filled with a liquid and a vial of powdered glucagon. 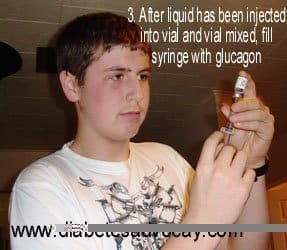 You prepare the glucagon for injection immediately before use by following the instructions that are included with the glucagon kit. In general, small children (under 20 kg, or 44 pounds) are given 1/2 cc (half the syringe), while older children and adults are given 1cc (the entire syringe). In kids, some authorities advise using 1/2 cc to start with, then giving the other 1/2 about 20 minutes later if needed. This method can lessen the rebound hyperglycemia that usually ensues after use of glucagon. What do you do when Glucagon expires? Expired kits can be great for retraining and practising. Ensure that all family members, teachers and coworkers know what to do in an emergency situation!